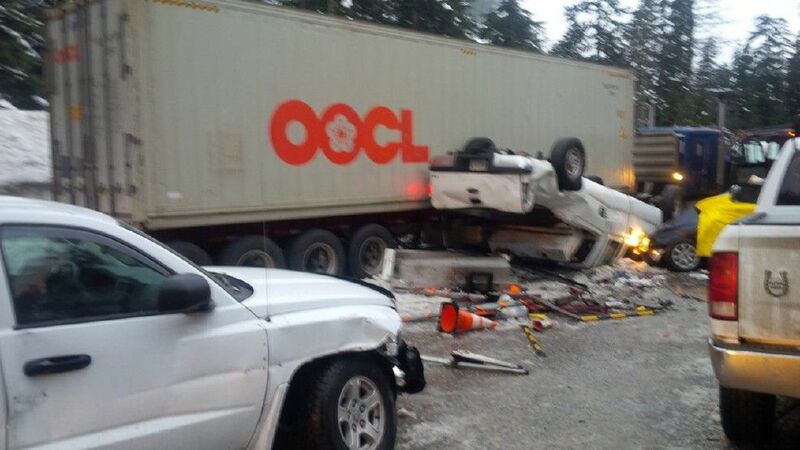 UPDATE 2/9: The Washington State Patrol (WSP) has identified the semi-truck driver who has been accused of causing a fatal crash near the Snoqualmie Pass last Friday has been identified as 24-year-old Daryel Rueda from Zillah, Washington. KIMA TV reports that Rueda has since been booked into the King County jail on suspicion of vehicular homicide, and that troopers believe he was driving under the influence of either alcohol or drugs when the crash occurred. UPDATE 2/8: The Washington State Patrol has released the names of the two people killed in Friday's crash. Richard Slightam, 49, and Carmen Lang, 50, both died at the scene. The five other people taken to the hospital after the accident have injuries that are not considered life-threatening. Our condolences go out to the families of Mr. Slightam and Ms. Lang. UPDATE 2/6: Trooper Chris Webb of the Washington State Patrol (WSP) has announced that the driver of one of the semi trucks involved in the fatal crash Friday morning has been arrested for investigation of vehicular homicide. KIRO 7 news is reporting that the arrest was made after the driver was interviewed by a Drug Recognition Expert (DRE) at Overlake Medical Center. Update: driver of semi-truck car hauler is under arrest for investigation of vehicular homicide. Will update when I receive more info. The fact that the arrest followed an interview with a DRE strongly suggests that the driver of the semi truck was arrested on suspicion of being under the influence of alcohol or drugs at the time of the crash. This is a significant development for many reasons, but primarily because it would likely place the truck driver at-fault for the fatalities and serious injuries resulting from the crash. ORIGINAL STORY: Two people were killed and westbound I-90 was closed this morning after a fatal crash involving two tractor trailer trucks. The Washington State Patrol reports that the crash involved up to 10 vehicles, and that others were injured in the collision. Troopers responded to the scene at approximately 6:20 a.m., following reports of a major collision on the pass. There were actually two separate collisions, involving multiple vehicles including two semi trucks. One of the large trucks involved was a commercial car hauler. At least two people were seriously injured and transported to the hospital after the crash. Two were pronounced dead at the scene. The Washington State Patrol is turning traffic around at the crash scenes. Westbound traffic is being stopped at Hyak, Ellensburg, and Easton. The westbound lanes of I-90 will be closed for at least several hours, with some reports saying that it will be closed all day. After a crash of this magnitude, it may take some time for an investigation to determine liability. The first thing that injured victims should do is seek treatment. For those with high medical bills, or for families struggling to pay for funeral costs and dealing with the loss of support from a loved one, it may be time to begin the process of speaking with a personal injury lawyer. The most important thing to remember is that once a person has been seriously injured or killed in a motor vehicle collision, the insurance companies have already begun working to defend or completely deny their responsibility for the damages that have resulted from the accident. Waiting to consult with a qualified truck accident lawyer can only hurt a victim's chances of a successful outcome.